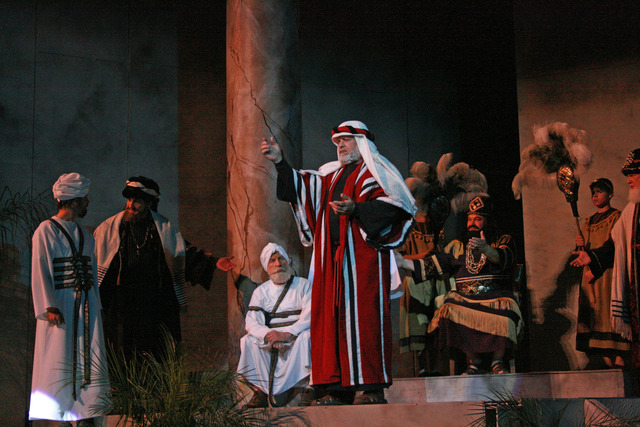 The Mesa Arizona Easter Pageant, one of the largest annual outdoor Easter pageants in the world, tells the story of the life and mission of Jesus Christ in a 65-minute production of dance, music and drama. With a cast of 450, all dressed in authentic costumes, and with magnificent staging and lighting that depict scenes such as the birth, crucifixion and resurrection of Christ, the onstage production is impressive in its pageantry and beauty. Behind the scenes, a crew of 400 puts in countless volunteer hours, and their families contribute, too. For many, assisting with the Mesa Easter Pageant has become a family tradition. Among those who have grown up with the pageant is Becki Burgess, of Mesa, Ariz.